Posted July 31, 2017 by Beau Bumpas & filed under Business Portraits, Headshots, Portraits, Your Photoshoot. Life is oddly serendipitous – this past May, I was shooting executive headshots and business headshots at the International Council of Shopping Centers (ICSC) RECon Convention in Las Vegas where I ran into my high school friend Daniel Eng. Daniel was doing what he does best – making deals and building his empire with a refreshingly happy and positive attitude. There’s a lot to be said at ICSC: the mood is uplifting at times because million-dollar commercial contracts are being closed, while at times panic-filled and terrorizing because other executives are nearly losing and chasing down deals. Not so for Daniel – he’s built a business around experience, authenticity, and market expertise. Daniel stopped by the studio to get commercial headshots in Dallas for his latest partnership with Sperry Commercial Global Affiliates and ENGVEST, along with his business partner Calvin Wong. Daniel was literally born with real estate in his blood – his parents both owned restaurants and were involved in real estate across Dallas. His family’s portfolio includes 50 local shopping centers throughout Dallas. Daniel started a company five years ago with two partners to run a real estate brokerage. Recently, he became affiliated with ERA to merge with his iRealty organization. They approached Daniel and came together to better serve clients in a changing market landscape. His goal is to help equip agents handle the market with fluctuations and challenges that are presented by the ebbs and flows in real estate. Serving with integrity is his overall mission – the “i” in ERA iReality stands for integrity. 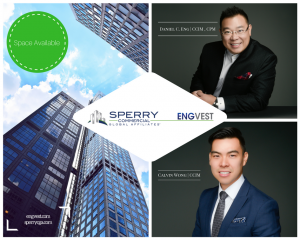 Most notably, Sperry CGA recently partnered with ENGVEST, another company owned by Daniel and he’s since partnered with Calvin Wong to ensure excellence and precision for each and every client. To book your group business headshots with me and give your company a professional look like Daniel has for all his organizations, give me a call or book online today.